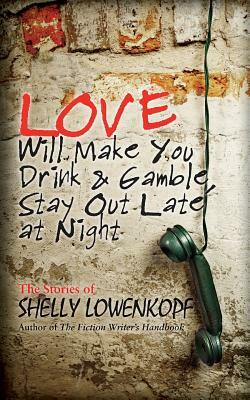 "Love Will Make You Drink and Gamble, Stay Out Late at Night" brings a number of Shelly Lowenkopf's previously published short stories together in a single volume. Lowenkopf is best known as a master instructor of fiction writing and a book editor. He taught for over thirty years at the University of Southern California, and now at the noted College of Creative Studies, University of California, Santa Barbara. All the while, he's been publishing these short gems. All the stories revolve around life in Santa Barbara, the oceanside city north of Los Angeles, where people go after they've burned out in San Francisco and L.A. But there's no safe haven anywhere. Interwoven into Santa Barbara's picturesque setting, the people in these twelve stories reveal what their hearts and souls encounter in relationships. Their misreadings, mistakes, and misadventures bare what happens to people who love another. "Shelly Lowenkopf is a gifted, humane story-teller," says author Aram Saroyan (Rancho Mirage). "'Love Will Make You Drink and Gamble, Stay Out Late at Night' is a delight.